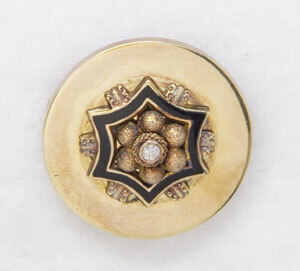 This antique 14K yellow watch pin has a polished surface with a highly decorated center. The center is crafted in three dimensions and is engraved. A single diamond is surrounded by hand-chased spheres and a black enamel invert scallop star. Circa: 1870.